A trifle for any time of the year, this is created from a home-made sponge swiss roll, real egg custard and tinned pears plus plenty of sherry! Ratafia biscuits – tiny macaroon-like almond biscuits – have a bittersweet flavour, rather like amaretti. 1 Start by making the swiss roll. Heat your oven to 220°C/425°F/gas 7. Using an electric mixer, whisk the eggs with the sugar in a large mixing bowl until the mixture is very light and frothy, and it will make a ribbon trail on itself. Sift the flour on to the mixture and carefully fold it in using a large metal spoon or plastic spatula. 2 Transfer the mixture to the prepared tin and give the tin a gentle shake so the mixture settles and finds its own level (if necessary, gently push the mixture into the corners so they are evenly filled). Place in the heated oven and bake for 10–12 minutes until the sponge is golden and starting to shrink away from the sides of the tin. 3 While the sponge is baking lay a sheet of baking paper (cut slightly larger than the tin) on the worktop and sprinkle it with caster sugar.As soon as the sponge is ready, turn it out on to the sugared paper and carefully peel off the lining paper.Trim the edges of the sponge with a sharp knife, then score a line across the sponge 2cm in from one short edge (take care not to cut right through the cake). Leave to cool slightly. Spread the jam evenly over the sponge, then gently roll it up from the scored end, using the paper to help you. Leave until cold before slicing. 4 Cut the swiss roll across into 14 slices. Arrange 8 of the slices, cut face outwards, closely together around the sides of the glass bowl. Arrange the 6 remaining slices over the base of the bowl. Crumble the ratafia biscuits over the top. 5 Drain the pears, saving the juice; set the pears aside. Measure 150ml of the juice (you won’t need the rest) and mix it with the sherry. Sprinkle the sherry/pear liquid over the sponge and biscuits in the bowl.With the back of a spoon gently press the sponge layer on the base to make it as level as possible. Leave to soak while you make the custard. 6 Put the egg yolks, sugar, cornflour and vanilla extract into a large heatproof bowl and whisk together until smooth. Heat the milk and cream in a large heavy-based pan until hot but not boiling. Pour the hot liquid on to the yolk mixture in a thin, steady stream, whisking constantly, then pour the mixture back into the pan. Stir constantly over medium heat until the custard just comes to the boil and thickens. Remove from the heat and set aside. 7 Quickly cut each pear half lengthways into 3 slices and arrange on the sponge/biscuit layer in the bowl. Pour the warm custard over the pears. Cover the bowl and leave until cold, then transfer to the fridge to chill for at least 2 hours until set. 8 Whip the whipping cream until it will make a ribbon trail on itself. 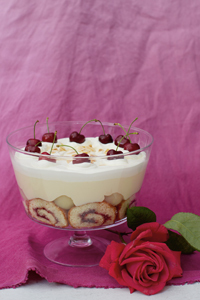 Set aside 3 tablespoons of cream for the final decoration, and gently spread the rest over the set custard. Scatter the flaked almonds over the surface.Whip the reserved cream until it will stand in soft peaks, then spoon in 10 ‘blobs’ around the top of the trifle – one for each portion. Decorate each ‘blob’ with a cherry. If not serving immediately, cover the bowl (without damaging the decoration) and keep in the fridge until ready to serve.